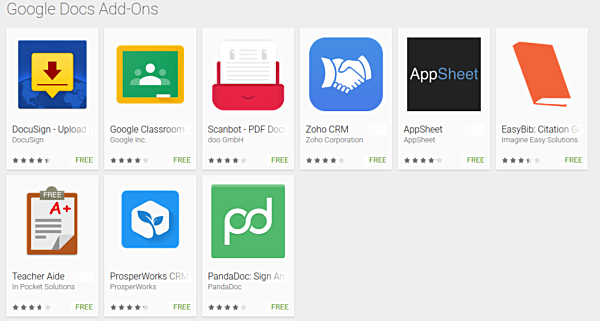 Google has announced add-ons for its Docs and Sheets apps on Android. The Mountain View, California-based company says these add-ons will help users get more work done on the go. "Whether it’s readying a contract you have for e-signature from your phone, or pulling in CRM data on your tablet for some quick analysis while waiting for your morning coffee, Android add-ons can help you accomplish more," Google says in a blog post. 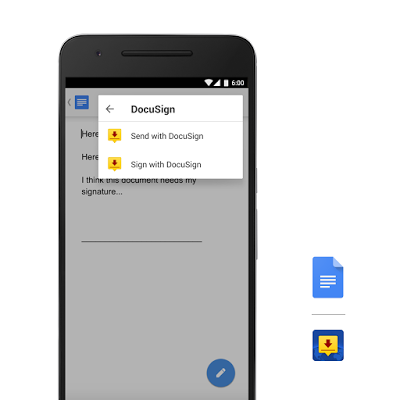 Some of these add-ons include DocuSign, which lets you create signature envelopes right from the Docs app; ProsperWorks, which allows you to import CRM data into Sheets; Scanbot, which lets you scan business documents using built-in OCR, and insert their contents into the Docs app as editable text; and more. The search giant has partnered with a total of eight app developers to create the Android add-ons - the list also includes PandaDoc, ZohoCRM, Teacher Aide, and EasyBib. You can download these add-ons from Google Play (link below) or by heading to the add-on menus in Docs or Sheets. Nice additions. With a screen, MHL and a BT keyboard the mobile office just got a little more powerful. Because the first thing you want to do when picking up a phone/tablet is edit documents. Now with the added benefit of sending anything you type to unknown parties.